He made the long haul from the Show-Me State. And then, William (Runt) Rageth and his working-class companion truly showed ’em how to cowboy up. 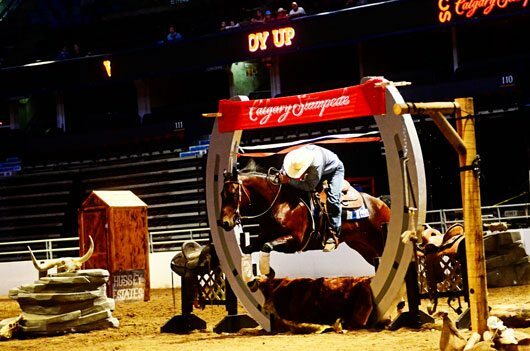 Rageth, 46, a ranch foreman from Harris, Mo., captured the Calgary Stampede’s second annual Cowboy Up Challenge on Monday evening at the Scotiabank Saddledome, outclassing a 12-team field in the championship final with a fast, smooth ride aboard his 10-year-old Grade gelding Burdock. 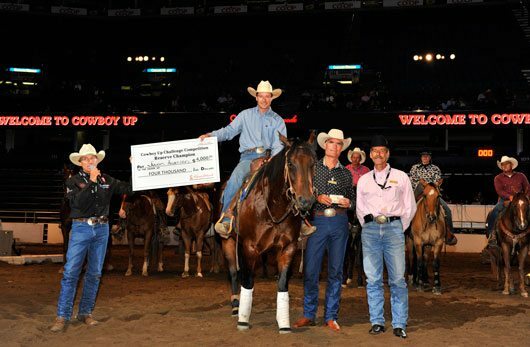 The key to victory, a cheque for $7,000, and one of those coveted Stampede buckles? Look no further than Burdock – who has no pedigree that Rageth knows of, but bucketloads of heart. “I don’t know anything about his lineage at all. I paid $750 for him, and it’s the best $750 I ever spent. Every time you ask him to do something, he just does it,” said a beaming Rageth following his win. “He doesn’t argue with you; he just hands it to you. He gets right on it. He’s an athlete. We do a lot of cow work on him back home, and you can go catch the cow, tie one down, whatever you want to do on him. The Cowboy Up Challenge, which was the first Extreme Cowboy Racing event held on Canadian soil back when it made its Stampede debut in July 2010, is sanctioned by the Bluff Dale, Tex.-based Extreme Cowboy Association (EXCA). The brainchild of Craig Cameron, who’s known as the “cowboy’s clinician,” Extreme Cowboy Racing is a timed and judged event that demands both horsemanship and speed – and is the fastest-growing sport in the equine industry, with more than 100 sanctioned EXCA events from Hawaii to Alberta to Maine. The sport challenges both horse and rider with an obstacle course that changes from round to round; riders are only allowed to preview the course minutes before the event begins, with no practice permitted. Judges award points for each obstacle, on a scale of one to 10, based on such criteria as horsemanship, cadence, control, and overall execution, with quickness also a major factor. For Monday’s Cowboy Up Challenge final, horse-and-rider teams had to negotiate bridges, moguls, jumps, serpentine courses, water boxes, and cowboy curtains – not to mention picking up an extra rider for a spell, and dragging a rodeo clown around the Saddledome infield on a hide. Rageth, who was reserve champion at the EXCA world finals last November at Topeka, Kansas, was fully in control for the final two days of the Cowboy Up Challenge. He and Burdock won the second of two preliminary rounds on Sunday evening, pocketing $1,000. And while point totals were reset to zero after preliminaries, the pair picked up where they left off in Monday’s final – with an extremely smooth run, and the fastest time of the night at four minutes and six seconds. Rageth’s winning score was tabulated at 128.255 points. James Anderson of Strathmore, Alta., and his quarter-horse mount CK Olena Doc, were reserve champions, collecting a runner-up cheque of $4,000 with a score of 121.725 points. Glenn Stewart of Baldonnel, B.C., and Genuine Jet Smooth, who won the Stampede’s inaugural Cowboy Up Challenge, finished third at 119.765 points for $2,400. Teala Caton of Exshaw, Alta., and Marshmellow were fourth with 117.955 points, Kateri Cowley of Exshaw, Alta., and Kokanee placed fifth at 109.395, and Chris Redden of Ravenwood, Mo., and Wrangler Baron Bar finished sixth at 103.710. “This was a tough course in the final, but the way the teams came through it shows their ability and their skill,” said Cameron. “What I liked about Runt and Burdock was the way they really attacked the course, with a lot of heart. They were truly going for the gold. And inquiring minds want to know, William . . . what about that Runt nickname?